Want to feel radiant every day? Start every day with the fine fragrance of LUX International Creamy Perfection beauty bar. This luxurious body soap combines the soft, feminine scent of white florals with a luscious, creamy formula to pamper your senses and care for your skin. Enriched with Swiss moisturizers, feel the difference when you lather up in the shower and reveal delicately perfumed and radiant skin worthy of a star. Crafted for women who want to feel beautiful every day, the precious essence of white flowers has been transformed into a sophisticated fragrance by the worlds top perfumers. The subtle scent of LUX International Creamy Perfection beauty bar lightly lingers on your skin, making it the perfect perfume for any occasion, morning or night. For maximum enjoyment, turn every bath into an exquisite pampering session. As you lather up, lush bubbles soap up decadently and gently cleanse your skin to leave it silky soft, smooth and irresistibly perfumed. LUX International Creamy Perfection beauty bar is the perfumed soap bar that brings out your extraordinary every day, with every shower. LUX beauty bar fragrances are crafted by the worlds best perfumers to transform your daily shower into an indulgent experience that will make you feel special every day. Explore the entire range of Soaps available on Nykaa. 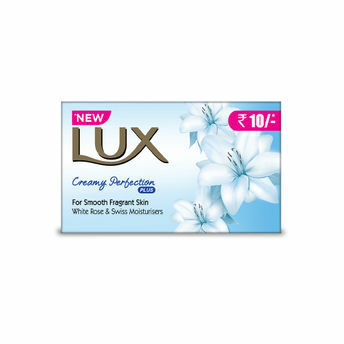 Shop more Lux products here.You can browse through the complete world of Lux Soaps .Alternatively, you can also find many more products from the Lux International Creamy Perfection Soap Bar range.